The BTC Motorsport season 2018 has culminated in a win for Josh Smith and the team at the BRSCC Championship Awards Dinner. Josh was awarded the ‘2018 Overall Champion & Class C Winner’ trophy, a result of incredible teamwork and dedication from the students and staff who run the team. The team is led and run by students. At each event there are at least two staff members present; the Motorsport Foundation Degree Course Leader, Josh Smith, who is the team driver, supported by Dan Perry and Marcus James. 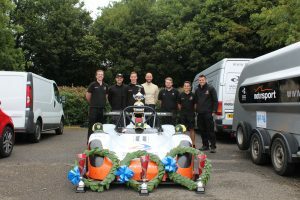 This season has been a huge success for the BTC Motorsport Team. Every event has brought something different, be it weather related, a mechanical issue or even the fact that for the last race of the season Josh was the best man at a friend’s wedding which meant we couldn’t race on the Saturday! However, throughout the season the students have proven themselves many times over and also learnt valuable skills in our industry. 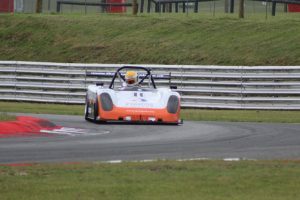 We were approached by Avon Tyres at the Silverstone GP event who asked if we could help them develop a tyre compound specifically for a Radical race car. This has given the team a valuable insight in to what is involved in tyre development within motorsport and how the smallest changes can have a massive impact. And four Driver of the Race awards! The plan for 2019 is to compete in the 750MC Bikesports championship – similar cars with tighter regulations. We will also have the luxury of working from the circuit garages instead of a race awning this season, which will benefit the team hugely. 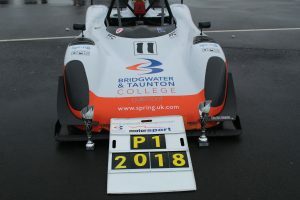 Historically our BTC Motorsport students have helped out other teams or privateers over a race weekend but the 2019 season will see the team not only running our BTC car but also a customer car. On a typical race weekend students gain a great technical understanding and learn procedures and requirements. Not only do they gain practical skills and knowledge but also personal development in time keeping, planning, self and team management, sense of urgency, awareness and teamwork. On a race weekend the students carry out a variety of tasks including setting up the race awning, tooling and equipment, unloading the race car, preparing the vehicle for scrutineering, carrying out pre and post-race checks, general maintenance and repair of the vehicle, track side activity on the pit wall and packing away at the end of a race weekend. Over the course of the season this team has developed and improved greatly and all are set for a successful career in the industry. Within the championship this season we had students/graduates placed with Chiron Sportscars, Corinium Motorsport, RLM Racing and some privateers. On a wider scope, students this year have travelled internationally, with teams such as Strakka Racing, to Belgium and Spain. The BTC Motorsport Team relies heavily on sponsorship as well as funding from the College. Without our sponsors we wouldn’t be able to run our car to the high standard required or be as competitive as we need to be to win championships. As a college we compete in a national championship and against some big teams with big budgets! We prove that with the right attitude, enthusiasm and of course, the right training, championships are within reach! Spring, Oakmont Construction, Performance Friction Brakes, Fuchs Silkolene UK plc and RLM Racing.